Stop SMA is proud to partner with JWH Equipment to bring you Laugh Away SMA. Comedians Tom Arnold and Henry Cho will deliver a world-class show that’ll have your ribs aching from laughter. As always, we’ve worked to have some amazing autographed collectables available during the pre-show auction. Your support helps us fund critical SMA research and provide specialized wheelchairs to young children. Laugh Away SMA is a stand-up comedy event featuring two nationally known comedians heading into its fifth year as our flagship fundraising event. We host the show in August, the month proclaimed by the Governor of Mississippi as SMA Awareness Month. The Muse Center in Pearl, MS serves as a top-notch venue for the show, capable of accommodating 2,500 attendees. Business name/logo on event promo materials, flyers, etc. Business name/logo displayed on promo materials, flyers, etc. The entertainment will be unlike any other event in the Jackson area. 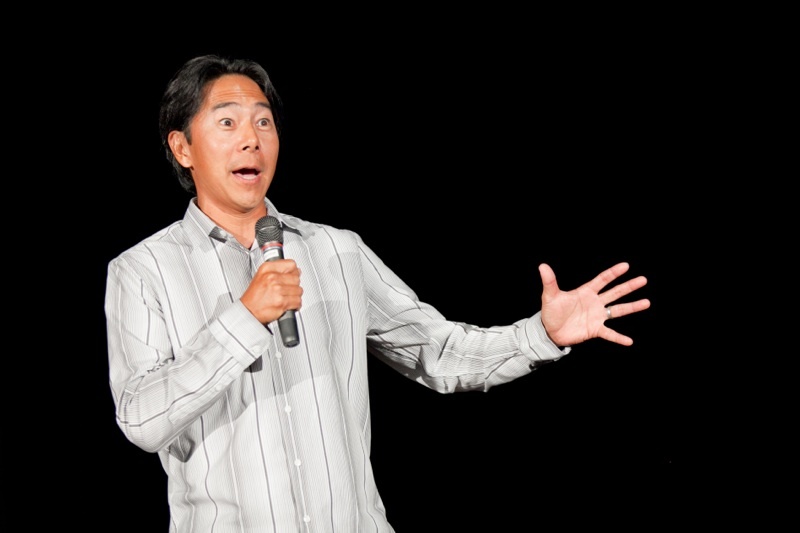 Comedian Henry Cho returns for what will be his fifth year at the show. We received tremendous feedback regarding Henry’s performance. Henry’s has become a strong supporter of Stop SMA and our mission. Henry has appeared in television shows and films such as the movie adaptation of McHale’s Navy, Say It Isn’t So, and Material Girls. His credits also include The Henry Cho Comedy Show, a one-hour comedy special on GAC. The Tonight Show has invited Henry on multiple occasions, and Henry has hosted NBC’s New Year’s Eve Special. Henry has toured and worked with: Reba McEntire, LeAnn Rimes, Willie Nelson, Lee Ann Womack, Vince Gill, Amy Grant, Brooks & Dunn, and Martina McBride. 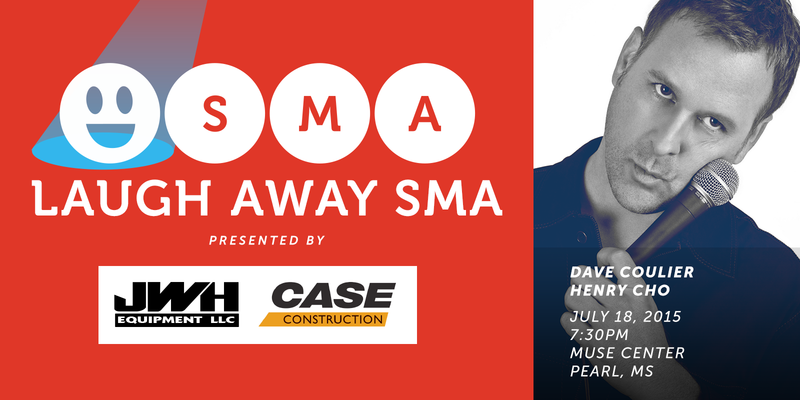 Because of Henry’s commitment and support, Stop SMA has been blessed with incredible headliner performances by Brian Regan, Jon Reep, and Tom Wilson. This year’s headliner will continue this record of excellence and we are extremely excited as developments unfold for Laugh Away SMA 2014. Grab the package for your desired sponsorhip level below. Complete the enclosed form and mail it to us. The City of Flowood will host its 13th Annual Benefit Golf Tournament on Wednesday, May 14 and Thursday, May 15. Proceeds benefit Stop SMA. If you are interested in participating, download the registration form. To learn about the tournament, see the recent story published by the Rankin County Times. For more information, contact Kay Shelton at 601-420-3327 or kshelton@ci.flowood.ms.us. The following article was written by Charles Bailey and originally published in the January 29, 2014 issue of the Rankin County News. FLOWOOD — Though the event itself is months away, officials say now is the time to get signed up to participate. The City of Flowood will host its 13th Annual Benefit Golf Tournament on Wednesday, May 14 and Thursday, May 15. The Four-Player Scramble will be held at the Refuge Golf Course, and the proceeds will benefit the Flowood-based Stop SMA (Spinal Muscular Atrophy) organization. Tournament organizer Kay Shelton said the event typically draws a full field a month before it is held. To sign up, call Shelton at 601-420-3327 or email her at kshelton@ci.flowood.ms.us. The 2013 tournament benefitted the local Juvenile Diabetes Research Foundation (JDFR). The tournament will be played in four flights. Following a complimentary breakfast, the first flight will begin at 8:30 a.m. both days. Lunch will be served each day from 11 a.m. until 2 p.m., and the afternoon flight will tee-off at 1:30 p.m. Businesses and other local agencies can earn valuable exposure by serving as tournament sponsors. Sponsorship opportunities are available for $10,000 (Ace Sponsor), $5,000 (Double Eagle), $2,500 (Eagle), $1,000 (Birdie), $500 (Par) and $200 (Hole) levels. The registration fee is $400 for a four-player team, or $100 for an individual player. Each team may purchase up to eight mulligans (or “do-over” shots) for $5 each. “We always have three awesome hole-in-one prizes, including a new car that Wilson Auto Group normally donates, Ben Nelson always gives a new golf cart, and Cowboy Maloney always provides a large, flat-screen TV,” Shelton said. Up to 20 local food vendors generally participate as well, including Back Yard Burgers and Corner Bakery, who will join forces to provide breakfast each day. Prizes are awarded to the First, Second and Third-Place teams in each of four flights over the course of the two-day event. Registration forms can also be picked up at Flowood City Hall and mailed to Kay Shelton, City of Flowood, P.O. Box 320069, Flowood, MS 39232. Checks should be made payable to the City of Flowood. Individual players are welcome to enter the tournament. They will be paired up with three other players to form a team, Shelton said.